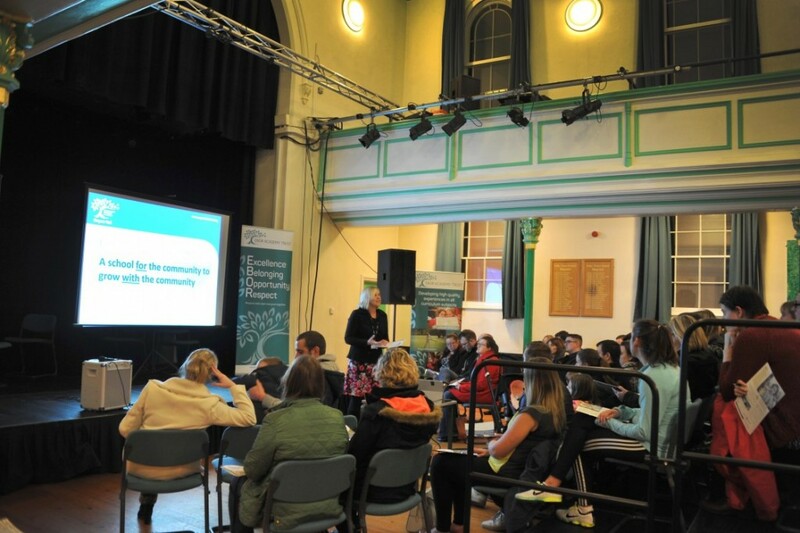 It was standing room only at Selby Town Hall as parents gathered to learn more about the new Staynor Hall Community Primary Academy, currently being built and which opens in September 2016. Headteacher designate Mrs Gail Brown, with colleagues from other schools in the York-based Ebor Academy Trust, which will run the new school, addressed over 150 parents, carers and children at an information evening last Tuesday. North Yorkshire County Council has assessed the need for extra primary school places which are likely to arise from the Selby’s new housing in different year groups in 2016/2017. As a result it has been agreed that the new school, in addition to opening up 30 Reception places to children starting school for the first time, should also offer places to children in Years 1, 2, 3 and 4. This will enable families moving into the development with children in these year groups to have a school place close to where they will be living. Parents were told that building work is progressing well and the school will open in time. It will be equipped with the latest technology and will also host a Tiny Steps Academy for eligible two-year-olds and a nursery for three- and four-year-olds. By law, all new schools now have to be either free schools or academies and the £5.5m Staynor Hall Community Primary Academy marks the first such school for North Yorkshire County Council. The county council will meet all costs in setting it up, with a contribution towards capital costs and the provision of the site from house builders Persimmon. The deadline for admissions is 15 January. All admissions to the new school itself is being coordinated through North Yorkshire County Council’s website.